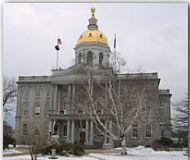 The capital of New Hampshire is Concord. According to the 2000 resident census population is 1,235,786. New Hampshire entered the Union on June 21, 1788 as the ninth state. Its nickname is the Granite State. State symbols are; the flower…Purple Lilac, the tree…White Birch, the animal…White-Tailed Deer, the insect…Ladybug. The origin of the name comes from the English county of Hampshire. 10 largest cities are… Manchester, 107,006; Nashua, 86,605; Concord, 40,687; Derry, 34,021; Rochester, 28,461; Salem, 28,112; Dover, 26,884; Merrimack, 25,119; Londonderry, 23,236 and Hudson, 22,928.